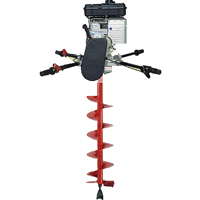 The Ground Hog C715 2 Man Gas Powered Post Hole Digger is one of the best Two-Man Gas Post Hole Earth Diggers out there. Two hands are better than one to accurately dig a hole. The ruggedly designed C715 promotes durability and requires very little maintenance. 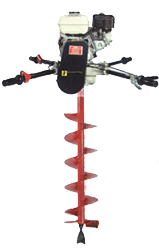 The transmission has an efficient worm drive design utilizing alloy steel shafts, large tapered roller bearings and the standard 7/8″ square auger drive. The aluminum castings are used throughout the two-man digger’s construction to produce a unit that is strong and lightweight for both users. The C715 uses an air cooled centrifugal clutch and a trigger-type, return-style throttle. Both operator positions are equipped with individual stop switches and tubular steel handlebars.